Following their review, today I am interviewed by The Literary Titan on Typhoon of Fire. 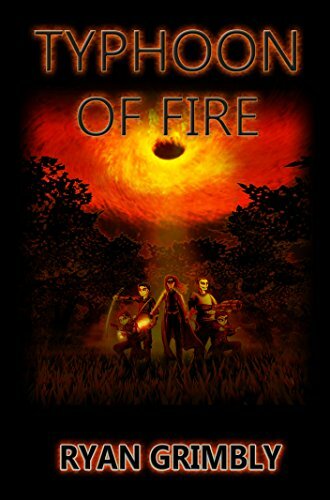 In Typhoon of Fire we follow Ace Mcdagger who teams up with Captain Loxwell of November squad to rescue her teammates scattered in the forests of Malaysia. What was the inspiration for the setup to this thrilling novel? During Call of the Conjurer, when the characters were new recruits to the hidden world of modern, magical combat; they spent a lot of time in a regulated, clean environments. The characters were usually safe. I wanted to go the opposite way in Typhoon of Fire. I wanted the situation throughout to be very rough, challenging and dangerous. My very first thought, visually, was of Vietnam era war films like “Platoon” and “Apocalypse Now”. The jungle is wild and hostile, and Malaysia is a location brimming with different environments which greatly inspired the events throughout. The characters explore flat, arid plains and damp rainforests, a rundown laboratory overrun by plants, an abandoned mine, a floating fortress above the clouds… I had a great time using colour schemes to set the mood. The use of natural environments also helped me to emphasise major themes in the book. Subjects such as ‘corruption of life’, ‘man versus nature’ and ‘Hell on Earth’. I felt that the novel was very well paced and kept me engaged throughout. Did you plan the novel as you wrote or did it all happen organically? It happened organically, for the most part. From my perspective, Typhoon of Fire is a prequel to another book I have written – but I decided it would be better to publish them chronologically. Certain events had to happen in Typhoon of Fire, and with that in mind I just had fun writing what I wanted: a creepy science-gone-wrong scenario! Developing the supporting cast and their stories happened organically as well. They were new characters, who would not necessarily be seen again; so their personalities, roles and fates were all blank slates. I enjoyed unravelling these characters, adding little twists to their personalities to surprise the reader. A lot of the characters are very different people by the end of the story, for better or for worse. I suppose in essence, the main plot of Typhoon of Fire was an after thought for me. The subplots, however; the individual character arcs which pave the way for future instalments, are the real meat and bones of the book. Away from all the magic and sci-fi, this is a book about humanity and frailty. Ace, Shimon, Tiffany, and Loxwell have brilliant dialogue and they feel like living characters. What things did you focus your character development on to bring your characters to life? I absolutely adore writing flawed characters. I like my characters fumble their dialogue, on occasion, or misunderstand information given to them. It makes them more human, to be far from perfect. I enjoy the concept of the “unreliable protagonist” and bear that in mind when I write. Sometimes the characters make mistakes, and sometimes they lie, even to themselves. They are supposed to be human, despite any super human magical powers they possess. Careful dialogue keeps them grounded and relatable. Tricky one! I actually have two books in the proof reading stage now. One is a direct follow up to Typhoon of Fire, called Bloodfest, which was the book I had written before this one but decided to release later. The other book I’ve completed is a supplementary story called The Sardonyc, which focuses on the Science Department mentioned throughout Typhoon of Fire. The Sardonyc is a very different book to what I have written before, but it is still within the same self contained universe. Bloodfest will be a straight up action horror / macabre comedy, continuing the adventures of Ace Mcdagger. He is more grown up and world weary by now, and is deployed to a mysterious island to dispatch a rising army of the undead. Definitely one for zombie fans! The Sardonyc is more of a psychological thriller, about a troubled new character named Sidney. He is part of a research team stuck on a ship in the middle of the ocean, and everybody is slowly going mad. Sidney must figure out why it is happening before he succumbs as well, and there are plenty of twists along the way. I hope the Literary Titan will review my next book soon – whichever one is out first! Today I am interviewed by hungrymonsterreview.com on Call of the Conjurer. 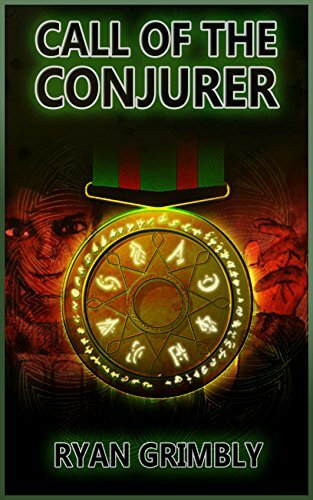 Call of the Conjurer is a story about a group of diverse soldiers brought together to be initiated into magical combat. What was your inspiration for blending military fiction with magic and the paranormal? Call of the Conjurer was actually written as a prequel to a homemade, stop-motion film some friends and I made when we were kids, way back around 1996. It was called Bloodfest, and it was mainly about a squad of modelling clay soldiers tearing through a Lego city full of demons and zombies. It would have been on youtube, if that had existed back then. Ultimately Bloodfest was just a weird little black comedy with minimal plot, although the whole setting and the characters stayed with me for years afterwards. It was when I started toying about with programming and began work on a Bloodfest video game that I started to give it more thought. The original story was a bare concept, and we had made the Bloodfest team far from professional – quite “Monty Pythonesque” in their quirkiness, so I had to ask myself: ‘Why was it up to this squad of soldiers to save the whole world from monsters? What made them capable to do such a thing?’ That was when I had the idea of giving them all super powers and magic spells. I wanted to make an RPG game, and to let players customise the characters with a selection of spells and abilities. I also thought more about the backstory, how the team were in service to a shadowy “Hidden Government” who deployed them to fight off extreme threats. Working on the world building to explain how and why the soldiers had magic; why their abilities were so rare and why there were monsters in existence, eventually led me to write Call of the Conjurer when I wanted to try self-publishing books. I decided to start from the beginning, and work my way up to writing Bloodfest as a novel. I never quite finished that RPG game, but maybe I’ll get back to it sometime! I felt that the military jargon and tactics used was well displayed. What research did you do for this novel to get it right? The main thing I had to research was what happens during military training, and then work that around the setting I wanted to write about. The military is something that has always intrigued me. In England we celebrate the heroism of those who fought in wars, and conflict is a big part of our history, so it is the kind of thing I’ve read about a lot over the years. I’ve also known a few people who have served in the British Army and United States Army, and one thing I wanted to get across in Call of the Conjurer was how these soldiers are just ordinary people with the same flaws and ambitions we all have. Bearing in mind the rarity of the recruits in the story – their magical abilities which are desperately sought after – the characters in Call of the Conjurer are granted more privilege than most soldiers would be given in reality. This allowed me to occasionally put the cast in relaxed situations where they could be themselves, which was important for building them up as a team who trusted each other, and letting them grow as individuals. There is magic used throughout the story. How do you keep magic believable in your story? For most of the characters in the book, magic is a startling experience to begin with but it eventually becomes second nature. Some of them had prior experience with it, and I wanted a world where magic is a natural force but being able to utilise it is a rarity. It is a mysterious power tied to genetics and human history, and the Hidden Government has an entire Magical Science department dedicated to studying the phenomena. Over the years these scientists have tried to quantify, categorise and explain magic; successfully turning it into a weaponised asset for battle, but like all fields of science their understanding changes with new developments. In this way I can make magic a standard tool for the soldiers who use it every day, but leave many mysteries and revelations to be explored throughout the Bloodfest series in upcoming books. There are a lot of diverse and interesting characters in this novel. What was your favorite character to write for and why? I wanted a diverse but small cast, and as Call of the Conjurer was written as a prequel, there were a few key characters that had to be included. I liked having this chance to re-establish characters like Ace and Shimon, writing about them several years younger where they were different people to how I knew them. Captain Mason was instantly a good character to write about. My aim for him was not to be a typical drill-instructor people might expect. He’s much kinder to the recruits (sometimes chastised for being so), but still has to be tough at times. He’s a warrior, and a powerful spell caster. He’s fatherly and considerate, though in private he is a very solemn individual with a huge burden on his conscience. His inner turmoil is a big undercurrent throughout the story, and becomes more impactful to the whole plot towards the end. I enjoyed writing Gretel as well. I wasn’t sure where she was supposed to go at first; how she would develop, but I wanted to write a character who is initially perceived as a snarky, aloof ‘Goth’ but actually has a lot of personality and depth. She’s full of surprises, and I’ve had a lot of feedback from people saying she was their favourite part of the book. The next book is Typhoon of Fire, which is finished and in the proof editing stage right now. The story follows the surviving recruits from Call of the Conjurer several years later as fully fledged soldiers now on active duty. They’re on a mission in an arid setting, living rough and facing greater threats in hostile conditions. “Hell on Earth” is a big theme of the story, and the whole book is a strange mix of Vietnam War films and Dante’s Inferno. 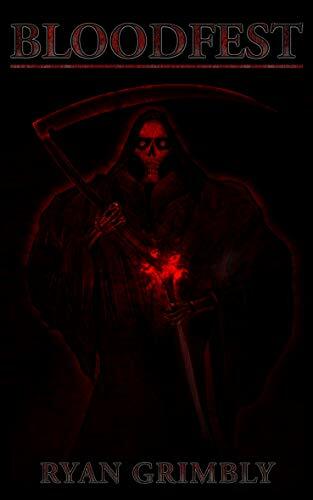 It is definitely grimier and darker than Call of the Conjurer was, taking away the safety nets and really pushing the characters into some difficult situations while expanding on the whole Bloodfest universe even more.